Most new receivers and transmitters use synthesized local oscillators which are locked to a crystal standard. However there are still many older or new homebrew rigs with free running local oscillators which are prone to drift. Often they do not have a frequency readout which is virtually mandatory in today’s crowded bands. This article describes a board which can be used to stabilize a free running local oscillator and provide a frequency readout in one package. The board consists of a front end gate/prescaler circuit, a microcontroller and a loop filter/VCO control circuit using a passive integrator and voltage follower. The front end samples the VFO signal, squares it up, gates and prescales it under the control of the microcontroller. The microcontroller counts the frequency of the VFO, decodes the data and displays it on an LCD display module. The controller itself has only an 8 bit counter which contains the most significant 8 bits of the count data at the end of each count period (100 msec). The prescaler U2 (74HC 4020) contains the other 14 bits of data. To access this the prescaler is toggled via U1:C (pin 9) until the prescaler output changes state. The controller keeps track of how many pulses are required and from this calculates the contents of the prescaler. Thus the overall resolution is 22 bits. This means that frequencies up to about 40 MHz can be counted to a resolution of 10 Hz which should be adequate for most applications. The controller converts the binary data to BCD and ASCII to drive the LCD display. The controller compares the frequency from one count to the next. If the loop is locked, the controller corrects any drift in the VFO by outputting a positive or negative pulse to an integrator/filter circuit. This is buffered by a voltage follower so that there is no significant voltage sag across the filter capacitor between counts. The voltage follower output is connected to a varactor diode which must be placed across the VFO tank circuit. The varactor should produce a frequency swing of about 5 KHz for a control voltage swing between 0.5 and 4.5V. If the VFO is likely to drift more than this then it should probably be redesigned or repaired! 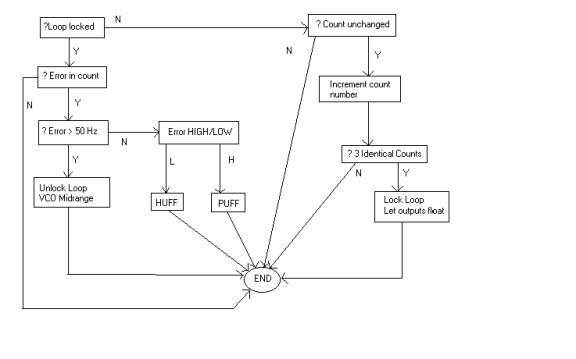 If the error between counts is more than 50 Hz it is assumed the VFO is being tuned and the loop is unlocked. In this case the circuit sets the VCO control to midrange and waits until there are 3 counts without change before locking the loop again. There is no need to manually lock the loop and the PLL system is invisible to the user. The data, once entered, is stored in the controller nonvolatile EEPROM memory. To enter the offset data the user connects two pushbutton switches between bits 0 and 1 of port B and ground. If ENTER (bit 0) is grounded during normal counter operation then the controller enters the offset setup code routine. The user is prompted to enter "POS" or "NEG" for offset. The SCROLL (bit 1) key is used to select the appropriate option. When ENTER is pressed again, the program moves to the offset frequency. The flashing cursor indicates which digit is being entered. The SCROLL key advances the digit from 0 to 9 and then rolls over to 0 again if SCROLL is pressed repeatedly. When ENTER is pressed, the next digit is selected. Note that the final digit is always 0 to indicate the frequency in Hz. After the final digit is entered the program returns to normal counting. The Offset data is stored in the EEPROM at an address selected by the 4 offset select lines. The user should set these lines appropriately before entering the setup program. When the counter is in operation it accesses the EEPROM at the address selected by the offset select lines and adds/subtracts the offset from the VFO frequency accordingly. As far as the PLL is concerned, the controller is merely an intelligent phase detector. Assuming that the VFO can be shifted 5 KHz by the PLL with a swing of 0.5-4.5 V, then the VCO gain Kv is 5000/4 ie 1250 Hz/V. The frequency count takes about 120msec with a pulse duration to the sample and hold circuit of 2 msec per 10Hz error. Thus phase detector gain Kp is 4*(2/120)/10 V/Hz or 7.5 mV/Hz. Using the PLL analysis program from KD9JQ with the loop values as shown (RC 82K and 33uF, damping 2.2K) then the 3dB loop bandwidth is 9.8 Hz and lock time is 34msec. The 10 Hz "reference" (ie the correction pulse) is not significantly attenuated and is audible on the VFO output, but in practice this was not a problem. If the 2.2K damping resistor (R10) is omitted, the attenuation of correction pulses is improved. In this case the resistor is replaced by a short circuit. In theory this would result in an unstable loop but as the loop does not have to capture lock, it does not appear to be a problem in practice. Some displays (eg Sharp) should mount directly via 0.1 inch spacing connectors (eg IDC style). Alternatively a cable can be made up using an IDC socket/plug or wiring the connections individually. If the backlight is to be used it will require about 2.3V at 70-100mA. For those who are interested to improve or modify the code I have included full source in assembler. I would be interested in any comments. Connections to the VFO/rig will depend on the rig circuit. A typical scheme is shown in Fig 4. In valve rigs beware of high voltages! If voltages are more than 50V then use high voltage blocking capacitors at the input to the counter (C4) and for C1 in Fig 4. If the board is to be built into an existing rig then it will be necessary to make connections to the VFO tank, the VFO output and an 8-12V supply. Consult the rig circuit diagram to determine the appropriate connections. The components D1, R1 and C1 should be added across the VFO tank circuit. Use the smallest value of C1 possible consistent with obtaining a sufficient tuning range (5 KHz). This will have to be determined by experiment. As an example the author used this circuit to stabilize a 5-6 MHz VFO. In this case the varactor used was a BB405B VHF diode with C1 2pf. Bear in mind that a varactor is a low Q device which may add to VFO noise or even cause the VFO to stop oscillating. If the varactor loads the VFO too much the tuning range could be reduced to 3 KHz without too much problem. The VFO will almost certainly have a buffer circuit. A sample should be taken at the output of the buffer via C4 for the input of the counter. (in this case I have shown an emitter follower buffer but of course each rig will have a different configuration) The counter input presents an impedance of approx 1000 ohms so the takeoff point should be reasonably low impedance. The counter requires approx 100 mV Pk-Pk for satisfactory operation. The counter is built on a double sided, plated through, masked and overlaid PCB. Fig 5 shows a top overlay. Mount the polarized components carefully (diodes/ICs/tantalums). Build the regulator section first and check that the supply is +5V before proceeding further. It is probably a good idea to use a socket for the controller though this is not mandatory. Be careful with static sensitive devices (ICs/controller) by keeping them in conductive foam before mounting and not handling with ungrounded objects. If the display is to be soldered in place it is a good idea to wire the display via a temporary harness to check operation of the counter before permanently wiring the display. (Note that the underside of the board will be inaccessible for troubleshooting once the display is mounted). As the board is quite simple it should not present any great difficulty to a constructor of intermediate experience. Usually there will be at least one error in the construction of a project. Before powering up the board check your construction again (avoid the temptation of skipping this bit!) Check the polarity of each component and go over the board with a magnifying glass to check for bad joints and shorts. Check for shorts to ground from +5V. Check that there is continuity between +5V and the relevant pins on each IC. If the board does not work first time adopt a systematic approach to troubleshooting. Assuming the regulator works correctly, first check the front end circuit by applying a signal of approx 200 mV PK-PK and look the output of the squarer (U1 pin 6). A square wave at the input frequency should be present. Check pins 4 and 5 of the controller where a 4 MHz clock signal should be present. Check the connections between the board and LCD module for continuity. There should be a series of pulses at a repetition rate of about 10 Hz on the control lines to the prescaler and the LCD data lines. Adjust VR1 to give best display contrast. If you are still in trouble check every single connection on the board for continuity and this should find the problem. Assuming the counter is working correctly, set the clock to exactly 4 MHz. Apply a signal of known accuracy to the counter and adjust C5 until the correct reading is obtained. Frequency counter module from which I copied the idea! Each homebrewer should check that modifications to his rig are safe and that the desired result will be achieved. The author accepts no responsibility for damage to equipment or persons as a result of using this circuit. Check with someone who has the relevant knowledge if you are not sure. !